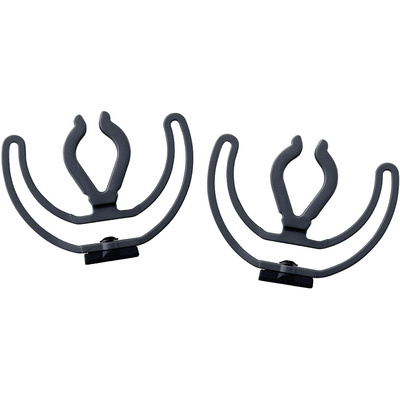 Product #21183 | SKU 042255 | 0.0 (no ratings yet) Thanks for your rating! From Rycote , this Pair of Softer (62-Shore) 19-25mm Universal Lyres (042255) feature Rycote's extremely robust, and virtually unbreakable design, as they do not use no elastic or rubber components which are prone to wear and tear. These completely backward compatible Lyres have replaced the original silicone O-rings suspension, and can be bought separately to upgrade older suspensions.The Lyre has now been enhanced further with a soft-grip internal surface on the mic clip. The soft-grip helps prevent the mic twisting or slipping, and stops the clip scratching the surface of the microphones which are powder-coated.